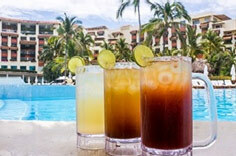 Riviera Nayarit, Mexico (August 5, 2016) - To finish off the summer on a refreshing note, enjoy three versions of the Michelada cocktail from the "Beyond All-Inclusive, Beyond All Compare" Grand Velas Riviera Nayarit. The word "michelada" combines "chela" (slang term for beer) with "ada" for "helada," meaning cold, and "mi" for mine - my cold beer. This cervezapreparada (beer cocktail) has been around for decades in Mexico, stemming from the usual practice of adding a squeeze of lime and a dash of salt to a beer. Now, these savory, spicy and tart drinks have expanded to include a variety of savory ingredients. Available at the resort and now to make at home, the first recipe is the traditional michelada, which has a sour flavor accompanied by a refreshing touch. The Cuban version, better known as "chelada," offers a more complex mix of flavors, using three different sauces. The third is a Cielo Rojo, whose aroma is intense because of the clam juice (Clamato). All three versions of the drink perfectly complement aguachile and ceviche as well as tacos for an end of summer fiesta. Directions: Frost the jar with a slice of pineapple or lemon, then dip the rim of the glass into salt. Add ice, lemon juice and salt. If you are preparing the Cuban, add the three different sauces. For the Cielo Rojo, also add the Clamato with all the other ingredients.